If you want to use SNMPv3 to prevent jobs from being released, be sure to configure the actual MFD as well as the PaperCut MF device to use SNMPv3. For information about blocking the release of jobs to a printer in error from a web-based Release StationPrint Release Stations place a print job on hold and allow users to release it when required. Often a Release Station is a dedicated PC terminal located next to the printers, however, Release Stations can take other forms such as a web browser based interface. Some common examples where Release Stations can be used include secure printing, approved printing, and authentication. In a secure printing environment jobs are only printed when the user arrives at the print area and confirms his or her identity. This ensures the user is there to collect the job and other users can't "accidentally" collect the document. In some organizations it may be appropriate to hold jobs until they are approved by selected individuals. A good example would be a teacher approving printing on an expensive color printer. Hold/Release queues can be used as a form of authentication in an unauthenticated environment. Users must authenticate prior to releasing their jobs allowing PaperCut NG/MF to confirm their identity., see Prevent jobs being released from a web-based Release Station when a printer is in error. For information about blocking the release of jobs to a printer in error from a Standard Release Station, see Prevent jobs being released from a Standard Release Station when a printer is in error. In the External Device Settings area, select the Enable print release check box. Select the Block the release of jobs when this device is in error check box. 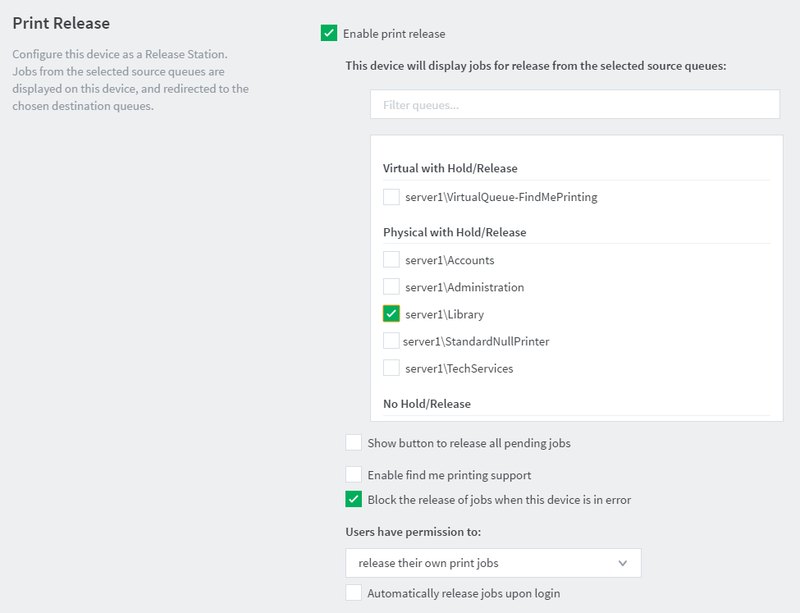 You cannot select to both not release jobs when a device is in error AND Automatically release jobs on login. This checkbox is available only for supported devices—not all devices are supported. As soon as a user logs into an MFD, the Application ServerAn Application Server is the primary server program responsible for providing the PaperCut user interface, storing data, and providing services to users. PaperCut uses the Application Server to manage user and account information, manage printers, calculate print costs, provide a web browser interface to administrators and end users, and much more. will start polling the SNMPSimple Network Management Protocol (SNMP) is a component of the Internet Protocol Suite as defined by the Internet Engineering Task Force (IETF). It consists of a set of standards for network management, including an application layer protocol, a database schema, and a set of data objects. Devices that typically support SNMP include routers, switches, servers, workstations, printers, modem racks and more. status of the device. In most cases, the state of the device will be updated in less than 5 seconds. We recommend using the default list of errors, but if you need to exclude any of these errors or add any additional errors, follow the steps below. For example, the default list does not include a low toner error because a user can continue to print even when this error is displayed. If you want to prevent the release of jobs when toner is low, you can add the lowToner error type to the default list. The selected errors apply only to the selected device. Click the Advanced Config tab. In Quick find, enter ext-device.block-release-on-error.snmp-error-list. The default value is DEFAULT, which includes all of the errors listed above. You can customize this list by either adding extra error types, or removing some of the default error types.by copying the list and then removing individual errors. In Quick find, enter ext-device.block-release-on-error.snmp-error-list. Release a test print job to a device in error to check if there were no copy and paste mistakes. 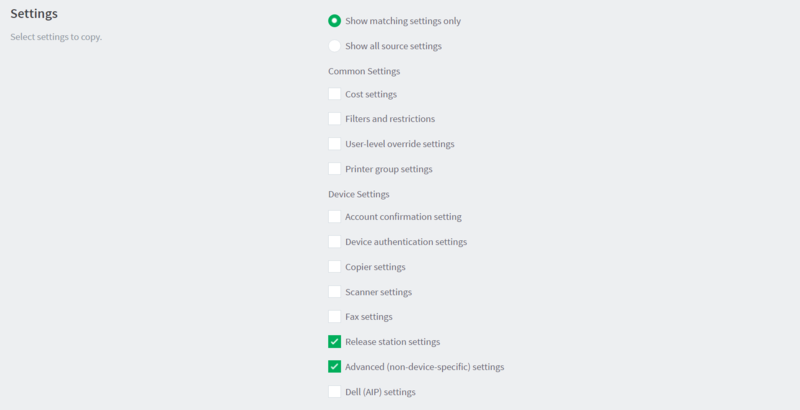 Rather than repeating the above steps for each device, you can copy the hold/release settings and apply them to selected or all devices. In the Actions menu, select Copy settings to other devices. In the Target area, select the rest of the devices to which you want to copy the hold/release behavior. This action copies all hold/release settings. Do not copy to devices that should not have hold/release enabled, or that have other hold/release settings that you want to remain different. In the Settings area, select Show all source settings.